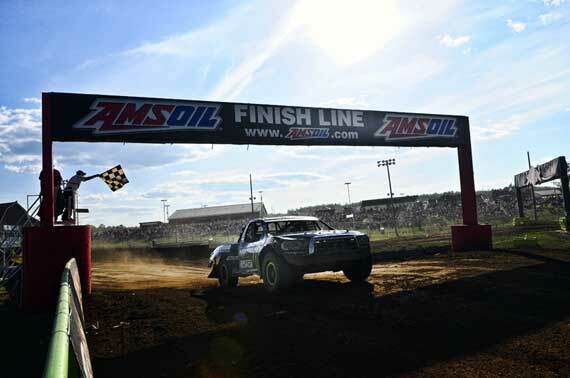 Abrams, WI (October 4, 2013)–The 2013 TORC Series season came to a dramatic close this past weekend as the series made its final stop at a track that was once one of the favorites on the off-road racing circuit: Primm. The track, located on the property of the Primm Valley Resorts and Casinos – Buffalo Bills Casino on the border of California and Nevada, would determine all pro series championships in the final racing weekend of the 2013 season. Saturday’s Pro 4 and Pro 2 races would be broadcast live on NBC and the Greaves wanted to make a good impression on the national audience for Monster Energy/ Toyota/ Maxxis Tire/ Method Race Wheel and the host of sponsors make it possible for Johnny and CJ to be successful on the track. 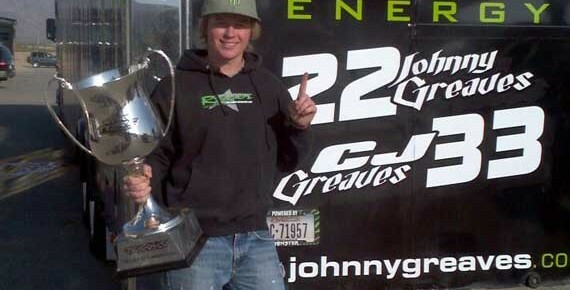 Greaves Motorsports was pumped and ready to put an exclamation point on an already stellar season for both Johnny and CJ. Johnny’s dominating season was made up of 6 wins, 3 second place finishes and several 3rd and 4th place finishes. He wound up in a very tight battle with Ricky Johnson for the top spot and came into Primm with a 3 point lead. It would take a good performance to leave with another championship to add to his legendary career. CJ would also be contending for a championship in the Pro Light truck class and looking to finish in the top 3 in Pro-2. Both Johnny and CJ hit the jackpot! Johnny captured his 6th Pro-4 championship by winning both races. CJ would also sweep the Pro 2 class taking the top spot in both races and landing him 3rd in the overall points standings behind Bryce Menzies and Rob MacCachren with 5 Oakley Bomb Awards. He was not as fortunate in the Pro Light races. He was collected in a crash on Friday that put him out of the race and was black flagged on Saturday. CJ did however finish the season second in the points in an outstanding 2013 effort. With only 3 points separating CJ Greaves and Keegan Kincaid, Friday’s Pro Light race was a great opportunity for CJ to close the gap. However, it was not to be. Keegan spun out right in front of CJ. The collision broke the A-arm on CJ’s truck taking him out of the race and seemingly, out of contention for the championship with only one race left. His luck would be different in the Pro-2 class. Jeff Kincaid led early with Bryce Menzies in 2nd and CJ in 3rd. Kincaid developed mechanical problems and had to pull out of the race leaving CJ and Bryce to duke it out. Bryce had already captured the championship but CJ had a lot to prove too. Menzies machine and CJ’s Monster Energy Toyota were battling hard. Bryce truck went around with the contact and CJ took the lead and eventually the win. The much-anticipated showdown between Johnny and Ricky Johnson was up next in the Pro-4 class. Rob MacCachren was also in the mix and was within striking distance of the championship too. When the green flag flew, Scott Douglas took the lead followed by Adrian Cenni and Ricky Johnson. Johnny was riding in the 4th spot when Ricky bicycled, opening the door for Johnny to move into 3rd. He quickly also passed Cenni and went after Douglas. Johnny made the pass just ahead of the competition caution. The second half of the race was all Johnny. He stretched his lead and cruzed to collect his 5th win of the season. RJ had a flat on the last lap but managed to limp in for the 2nd place spot complete a great come back. Saturday, the Pro-4’s were live on NBC. Johnny and Ricky Johnson were side by side on the pace lap, when all of a sudden, Ricky pulled off the track with mechanical problems. When the green flag flew, Johnny had the championship but still wanted to put on a good show for the TV audience and the fans. He was in 3rd place by lap 5 with Rob MacCachren in the lead and Adrian Cennie in 2nd. When Cennie went up in smoke, Johnny G was in 2nd leading up to the competition caution. The top two held there positions as the white flag flew. Rob Mac had a comfortable lead but saw it disappear when his right-rear tire went flat and began to shred. Johnny passed him about halfway into the final lap to take the win and the weekend sweep to go with his championship. CJ rolled off 3rd in the Pro-2 race which was also being broadcast live on NBC. Bryce Menzies had already captured the championship but, after the race on Friday where CJ pulled off the win, it was apparent that he wanted to win this race. The 18 year old Greaves was in 2nd by lap 2 behind Menzies, setting up a classic showdown between the two. Rob Mac was also in the mix, but went over the K-rail and off the track. In the second half of the race, CJ pressured and finally made the pass as Bryce lost it in turn one. CJ took the win, the sweep and ended the incredible season he has had. With the back-to-back wins, CJ jumped a spot in the standings to the top 3. In the Pro Light class, CJ worked his way through the field and was up to 4th place by the mandatory caution. Race officials gave him a black flag for the “jumping the restart.” He didn’t take the black flag so they stopped scoring him. In spite of the trouble, he finished the season 2nd in the points standings. His outstanding year consisted of 10 podiums. Johnny Greaves Motorsports would like to thank all of the great sponsors that help them be competitive in each race: Monster Energy, Toyota, Maxxis Tire, Method Race Wheels, MagnaFlow, MasterCraft, Amsoil, Fox Shox, Kawasaki, Oakley, Boatec, Liquid Force, VP Racing Fuels, AKA, Baileigh, and Team Associated. Abrams, WI (September 4, 2013)–The thrills and spills of ‘the Big House’ are what off-road enthusiast talk about year-round. This year’s race lived up to the reputation of the legendary track located in the middle of Wisconsin. Greaves Motorsports entered the weekend in very tight points races with only 4 rounds of racing remaining in the season. At the end of racing this past Sunday, Johnny had edged back ahead in Pro-4 while CJ saw his Pro Light lead drop to second, but only by a narrow 3 point margin. He also exchanged 3rd place with Chad Hord in Pro 2WD by a few points. 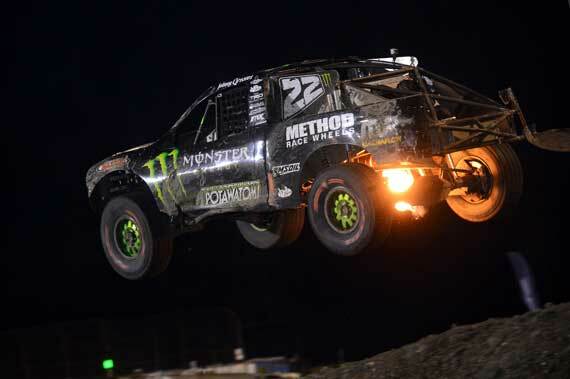 The much-anticipated Off Road Championship races at ‘the Big House’ at Crandon International Off-Road Raceway has come and gone, leaving another story line that legends are made of. Johnny Greaves Motorsports wrote a chapter of its on with an epic finish to the AMSOIL Cup race on Sunday–the successor to the BorgWarner Cup races of the past. The cup race pits Pro-2’s against Pro-4’s. With CJ racing in the Pro 2WD class and Johnny in the Pro 4×4 class, what are the odds of the two going head-to-head in a race to the finish line? Whatever the odds, it happened. CJ beat his dad to the finish line in a photo finish to become the youngest driver to win the Pro-4/Pro-2 shootout. With the parade, concert and Friday’s festivities behind them, Johnny and CJ were ready to race. CJ took his Monster Energy/Toyota/FC Potawatomi/Maxxis Tire/Method Race Wheel Pro Light to the line first for the land rush start. CJ got a great start and lead almost the entire race. He was able to hold off a late race charge by Keegan Kincaid to get the win. With CJ, Kincaid and RJ Anderson on the podium, Maxxis Tire proved to be the dominant tire manufacturer. Up next was the Pro 2WD class which featured 22 drivers made up of several West Coast drivers participating in the Crandon races. CJ pulled a terrific start, beating all but 2 to the holeshot in the Potawatomi turn one. He fell in behind second place Bryce Menzies with Jeff Kincaid in the lead. The top 4 trucks battled hard. CJ, using the argon turn and the backstretch as his passing lane of choice, was able to muscle his way around Menzies to take over 2nd. Following the competition caution, the top 4 were hanging it out. With about 2 laps to go, some contact with Menzies sent CJ’s wheel flying through the air. CJ stopped dead in his tracks, unable to finish the race. It was a bitter disappointment since it was anybody’s race at that point and CJ was going for it. As a consolation, CJ grabbed another Oakley Bomb award for the fastest lap, his 4th of the year. 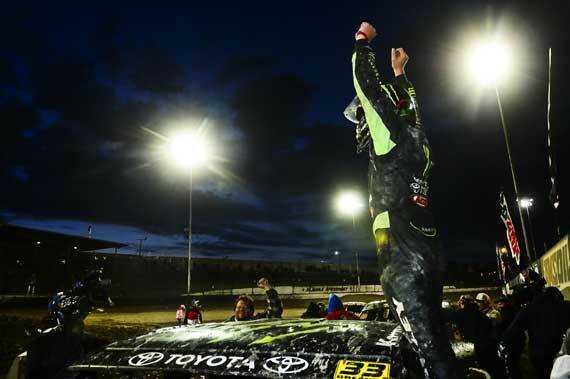 Johnny climbed aboard his number 22 Monster Energy Toyota, ready to take on the familiar Crandon track. Johnny G was in 4th as the field roared past the thousands of screaming fans along the front stretch hillside. He was trying to be patient but as the top 3 began to pull away, Johnny began to realize he had a tire going down. At the competition caution, Johnny hustled past the pace truck and headed to the hot pits. On the restart, Johnny began to pick-off one truck after another. He made his way to 5th position as the white flag flew for the final lap. Determined to grab as many spots as possible, he made a last lap charge for the 4th place running Mike Jenkins. He made the pass, but it was a photo finish, passing Jenkins just ahead of the finish line. Rain overnight and in the early morning caused all the races to be pushed up. As the skies gave way to sunshine, the sportsman class races, got the track ready for the pro classes that started with the Pro 4×4’s. Johnny and Ricky Johnson had their typical high-octane clashes leading up to the competition caution. JG and RJ appeared to be having a conversation as the pace truck lead the field around the track with Ricky rolling in the 3rd spot and Johnny right on his tail in 4th. Steam was already coming out of the Johnson machine. Johnny was able to get around Ricky in the gravel pit turn and he set his sights on the 2nd place Scott Douglas. Johnny was unable find his way around Douglas after several attempts. He ran out of laps and rounded out the podium in 3rd. RJ finished 7th, which gave Johnny the necessary points to regain the lead in the standings. Three rows of 2-wheel drive trucks lined up for the Pro-2 race. CJ did not get a great start and was mired deep in traffic early in the race. He was working hard and clean to make his way to the front. With so many trucks on the track, there was carnage taking place all around the track: Jarit Johnson hit the wall, Mark Jenkins flipped on his side, and another truck ran into the wall. Menzies, Hord, and Kincaid were the top 3 at the competition caution with CJ not far behind in 6th. CJ was able to get around Matt Cook and Jeff Kincaid to end the race in a hard fought 4th place. CJ was now ready to defend his points lead in the Pro Lights late Sunday afternoon. He was looking strong early but unfortunately, a flat tire sent him to the hot pits and out of contention. He rejoined the race and finished 13th. 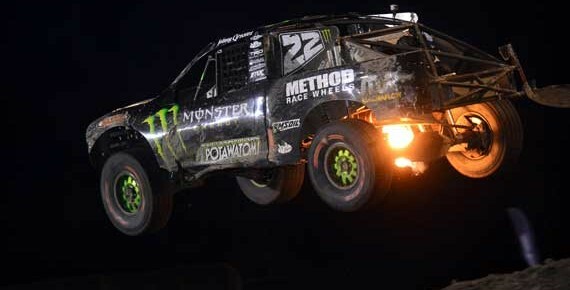 The final weekend of the 2013 TORC Series season will take place at Primm Off Road Raceway in Primm, NV on September 27th and 28th. With a very tight points race in Pro 4 and Pro Light, the 2013 champions will be decided in these races. Johnny and CJ will be ready and it should be a very exciting weekend of racing! 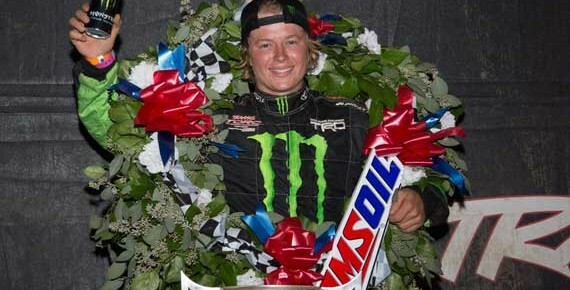 Abrams, WI (August 14, 2013)–Johnny and CJ Greaves were wound up tight and ready to keep the momentum going from Chicagoland as the TORC series headed to the track made famous by motocross dating back to the mid 70’s: Red Bud MX Park. CJ did great in the Pro Light class, taking home a first place and 2nd place and extending his points lead in the standings. 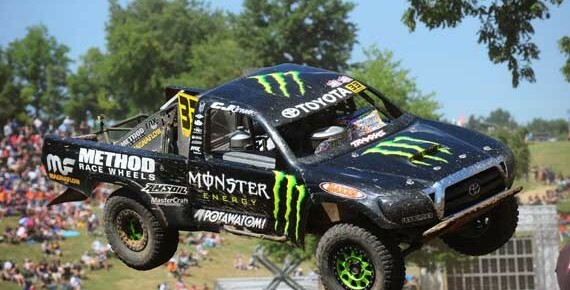 He also managed a 2nd place in his Monster Energy / Toyota / Maxxis Tire / Method Race Wheels / MagnaFlow truck on Saturday. This also moved him up a spot, to 3rd, in the standings. Johnny pulled a 5th place on Saturday after leading for a while, then falling victim to a black flag that took him out of contention. Sunday was a tough day as both Johnny and CJ suffered a few setbacks in the full size truck classes. CJ received the Maxx Lap award for the fastest lap in both Pro Light races and an Oakley Bomb award in Pro 2WD. The rich black dirt, step-up jumps, tight turns and single lane racing of Red Bud presented a challenge to the TORC Series racers for rounds 11 and 12 this past weekend. 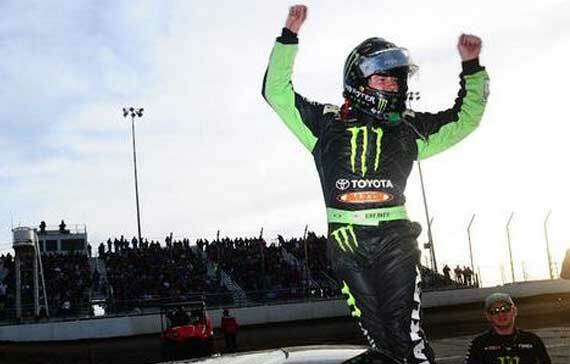 Johnny and CJ Greaves were up to the challenge and had their Monster Energy Maxxis Tire Toyotas dialed-in and ready. Saturday started with CJ taking a dominating victory in the Pro Light class. He saved a lot of tear-offs by taking the lead quickly on lap one and holding it throughout the race with only a few challenges by Keegan Kincaid. He also earned the Maxx Lap award for the fastest lap. CJ gathered himself for the quick turnaround for the Pro 2WD race. He took the rolling start green flag from the second row beside Chad Hord. CJ took advantage of Jenkins and Hord’s wide turn in the sweeper to move up into the 2nd place spot early in the race. With not a lot of places to pass, CJ was patient and found the right place to pass Oberg for the lead, which he grabbed and held all the way to the competition caution. On the restart, Bryce Menzies took the lead as his right front tire began to lose pressure. Fortunately, 3rd place and back were having fierce battles allowing CJ to maintain his second place as the tire continued to go flat. As the crowd held their breath and Rob Mac reeling CJ in, he was able to hold on and take the second place. Johnny was up next in Pro 4×4, starting his Monster Energy Toyota on row 2. As all the teams tried to adjust to the track, trucks were crashing, spinning out and exiting the race. Following a full course caution, Greaves passed Cenni for the lead. A few turns later, Johnny caught a rut, bicycled and almost went over. He saved it, but in saving it, he went off track. Johnny hustled back towards the track. Johnny was black flagged for “staying in the gas while off the track” which sent to the rear of the field once again. Johnny battled back to 5th before the race was stopped for a long time in order to free Ross Hoek’s truck which was stuck on the K-rail. Ricky Johnson headed to the hot pits for either a tire or repairs allowing Johnny to move to the 4th position as they waited for racing to resume. When racing resumed, the flat tire bug bit Johnny in the closing laps. He was able to stay in the race and finish 5th. Sunday, CJ started on row 3 as the Pro Lights lined up in the black dirt of Red Bud. When the green flag flew, CJ headed for the front–ending up in the third position by the end of the first lap. A full course caution when the number 61 truck overturned. CJ passed Kleiman on the step-up jumps to take second where he remained until the last lap. With very few opportunities to pass, CJ tried several attempts to get around the front running Mittag. On the final turn, they went door-to-door. But Mittag had a little more momentum to propel him to the lead and get the win. CJ came in a close 2nd. He also received his second Maxx Lap award for the fastest lap for the weekend. CJ jumped off the podium for the quick turnaround to Pro 2. CJ was looking strong and headed to the front, working on Steve Barlow for the 5th position. Steve lost control over the face of a jump and CJ came in contact with him in the air, further spinning out the out-of-control Barlow. To avoid the penalty box, CJ pulled over to allow Barlow and Hord pass him back. Due to the contact, CJ had a piece of fiberglass blocking his view. During the momentary caution, he pulled over to have a track worker pull it off, resulting in another black flag for outside assistance. He was sent to the rear of the pack again. The resilient Greaves battled back for a second time, catching the 2nd place running Rob MacCachren, who was suffering from a low tire with 2 laps remaining in the race. CJ caught him and on the finish line turn, made a perfect inside move to pass Rob Mac. Rob, trying to protect his position, hit a huge hole in the middle of the track, which threw him back causing CJ and him to trade bumpers leaving Rob’s truck with a flat. CJ made his way around the limping Rob Mac’s truck to finish 2nd! After the race, USAC officials gave CJ another black flag for the contact with Rob and docked him 7 positions. As a result, he finished 9th but earned the Oakley Bomb award as a consolation. Johnny, hoping to have better results than Saturday and keep his points lead. Johnny G started on the front row due to the inversion with Rob Mac beside him. Johnny, still fuming from the black flags for CJ, was on a mission and was not holding anything back. He immediately took the holeshot and the lead as the green flag flew. Unluckily, he caught a rut again and bicycled in the off camber downhill turn. He went from first to dead last as the field went by. With a fender in his face, he began to work his way back through the field–a feat he has done many times in the past. Mark Kvamme over-rotated just in front of Johnny, collecting him as he tried to regain control. Then Johnny also spun to lose even more momentum while the menacing fender continued to hamper his vision leading up to the competition caution. As racing got underway once again, Johnny worked his way up to 6th before bad luck struck again. His right front tire succumbed to the earlier contact and caused Johnny to have to pull out of the race. Johnny took a hit in the points but only dropped to 2nd but only 1 point behind RJ. Johnny G Motorsports will now set its sights on Crandon International Raceway for the much-anticipated Labor Day weekend race at the legendary track. The festivities begin on Friday with the parade in Crandon and racing on Saturday, August 31st and Sunday, September 1st. Coming in to the final 2 weekends of racing, both Johnny and CJ are in close battles for championships in Pro Light and Pro-4. It should make for some very exciting racing which will be televised live on SPEED TV and on the internet. Abrams, WI (July 22, 2013)–Greaves Motorsports rolled in with the wind at Route 66 Raceway located next to the Chicagoland Speedway for another action packed weekend of racing. 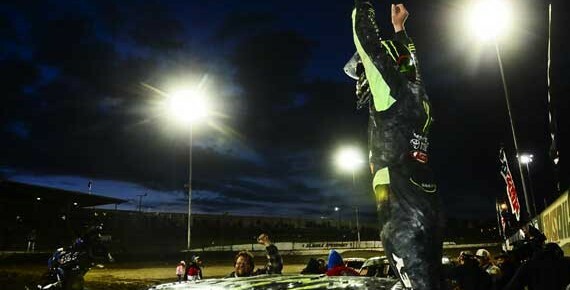 Although thunderstorms were in the area, the rain stayed away long enough to get both nights of racing in for The Off Road Championship (TORC) Series rounds 9 and 10. The Saturday race was broadcast live on SPEED TV. Both Johnny and CJ gave the near capacity crowd their money’s worth with thrilling finishes and heart stopping racing. When the final checkered flag flew, the guys had podiumed in 5 out of 6 races. Johnny had a 1st and 2nd place accompanied by 2 Oakley Bomb Awards. CJ had a 1st and 2nd in Pro Light and a 2nd place in Pro 2WD. He also collected another Maxx Lap award in Pro Light for the fastest lap in Saturday’s race. Johnny stretched his points lead in Pro-4 while CJ edged closer to the top spot in Pro Light and is only 6 points out of first. He is maintaining his 4th place standing in Pro-2. CJ was up first in the Pro Light class on the full moon lit Friday evening. Starting from the 4th row of the 17 truck field, he had a good start, landing in 5th as the trucks entered the highly technical infield turns. CJ got in the loose dirt coming out of the turn and spun off the track. He saved it but lost a couple of positions. Meanwhile another truck overturned bringing out a full course caution and a full restart of the race. This time, CJ Greaves drove his number 33 Monster Energy Toyota through the middle of the pack up to the 6th spot. He was in the top 5 by the mandatory caution. CJ lost a spot on the restart but got it back quickly, then passed Kleiman for 4th and set his sights on the third place running Rafael Navarro. The 2nd place Mittag was off pace and everyone moved up a spot. Brad Lovell had stretched his lead to the point that the race to watch was between CJ and Navarro. As the final laps loomed, CJ tried several times to pass Navarro. On the last lap they were nose to tail as they came into the final turn. As CJ pitched it sideways into the turn the two made door-to-door contact. CJ was able to just stick the nose of his truck ahead of Rafael as they crossed the finish line as the crowd cheered their approval of the exciting end to the race as CJ took the 2nd place finish! Pro-4’s were up next, which gave CJ a little more time to prepare for his Pro-2WD race. Johnny started on the 3rd row for the 2×2 rolling start. The powerful Pro-4’s were plowed through turn one. The black Monster Energy, Maxxis Tire clad Toyota went high against the wall searching for maximum traction. As the field leveled out, Johnny was in 5th with Mark Jenkins leading the way. By lap 2, he had passed Mike Jenkins for 4th as Scott Douglas and Ricky Johnson were knocking each others fenders off for second place. The battle spun both of them out sending Johnny up to 2nd. Johnny Greaves, sandwiched between the two Jenkins brothers, made a great move around Mark for the lead, only to give it back to him leading up to the competition caution. Ricky Johnson had worked his way back up to the front and would be in the mix as the laps clicked off. With the white flag in hand, Johnny got a great run in the final turn to make the pass on Mark Jenkins. RJ was also able to pass Jenkins halfway through the final lap, setting up another classic JG/RJ battle. RJ poked the nose of his truck inside and outside of Johnny and does a slide job into Johnny on the final turn. The two banged fenders down the front stretch as everyone stood to their feet and held their breath. Johnny was able to out muscle RJ and take the win! He also claimed his 4th Oakley Bomb Award for the fastest lap time. With the 6 truck inversion, CJ started in the sweet spot on the front row of the Pro-2 class. He quickly took the lead as the green flag flew with Jeff Kincaid staying close. The top 2 pulled away. Chad Hord was taking the brunt of feuds with Menzies and Rob MacCachren allowing CJ and Kincaid to pull away. CJ, who recently graduated from High School, was leading the race at the competition caution midway through the race. Kincaid, got into CJ as the two headed into tight infield turn that ruined the weekend for a lot of trucks. CJ wisely backed-off to avoid a crash allowing Kincaid to take the lead. Even though Kincaid was experiencing mechanical problems, CJ was not able to get around him and settled for 2nd place. Bryce Menzies passed his teammate, Travis Pastrana, to claim the 3rd place on the podium. CJ had the fastest lap times in practice Saturday morning in Pro Light and 2nd fastest in Pro-2 giving the team confidence as they looked forward to the televised evening races. After a long day of race preparation, Johnny G Motorsports was ready for an exciting evening of racing at Route 66 raceway. The Pro Lights were on the track first with CJ starting from the 3rd row with the inversion. As the pack of 17 trucks sorted themselves out through lap 1, CJ was in the top 3. As the teams tried to figure out the track, the second place running Navarro bicycled-it allowing CJ to take 2nd. The 2nd place position was short though as CJ had some trouble of his on, spinning out in the hairpin turn. He stayed in the gas and only dropped a couple positions. The running order is now Bradley Morris, Navarro, Lovell and CJ. Another truck rolled over, this time bringing out a full-course caution. On the restart, CJ powered his Monster Energy / Toyota / Maxxis Tire / Method Race Wheels / MagnaFlow truck through turn 1 with a great run and edged himself into 3rd place. He caught another break when the top 2 trucks tangle up propelling CJ to the lead! The top-3 checked out from the rest of the field leading up to the competition caution. With a hungry pack of pro lights in tow, the restart would feature a lot of aggressive attempts to earn a top position. In the process, CJ was able to hold off Navarro and maintain his lead. However, a big crash by Mittag brought out another full course caution. When racing got underway, CJ began to stretch his lead and took the victory by 20 car links over Keegan Kincaid and Rafael Navarro which gave him a big boost in the points standings. Pro 4×4 trucks took to the stage next. Johnny Greaves, again starting from the 3rd row, went to work and moved up into the 2nd place spot by going the long way around Scott Douglas in turn 1. Rob MacCachren was in the lead. On the restart, following the competition caution, Johnny made an inside move on Rob Mac as the two went door-to-door to take the lead in the final tight infield turn. RJ and Douglas were doing battle and RJ also moved up a spot into 3rd. The top 3 battled hard the remainder of the race. Johnny caught a rut and almost went over, but was able to save it and maintain his lead. However, Rob was able to get around Johnny in the same place he lost the lead earlier. Rob went on to get the win and Johnny took a close second. He picked up another Oakley Bomb Award too. In the final race of the weekend, CJ was strapped into his Pro-2 and ready for action. With the cameras rolling he was hoping to give the fans a good show. CJ showed a lot of poise as he powered his machine through the middle of a logjam as the trucks hit turn 1. A full course caution stopped the action as Jarit Johnson hit one of the huge tire barriers in one of the infield turns, which landed on top of his truck. It took a while for the track crews to remove the tire. Officials decided to have a complete restart. CJ made his way into the 4th position with Rob Mac pressuring him for the spot. CJ was able to hold him off up the competition caution. Chad Hord was in the lead followed by Menzies, Kincaid and CJ. On the restart, Rob Mac was able to get around CJ. The top 5 stayed the same until the last lap. Rob Mac was working hard to gain another position when he lost it one of the turns and spun out. CJ was able to move up a spot and finish 4th to complete a weekend of racing. Greaves Motorsports had another very successful weekend of racing: podiums in 5 out of 6 races! The TORC series will travel to the other side of Lake Michigan as it heads to Red Bud MX Park in Buchanan, MI on August 10th and 11th. Be sure to follow Johnny and CJ on Facebook @johnnygreavesmotorsports, on Twitter @Greaves_Racing or on our website: JohnnyGreaves.com. 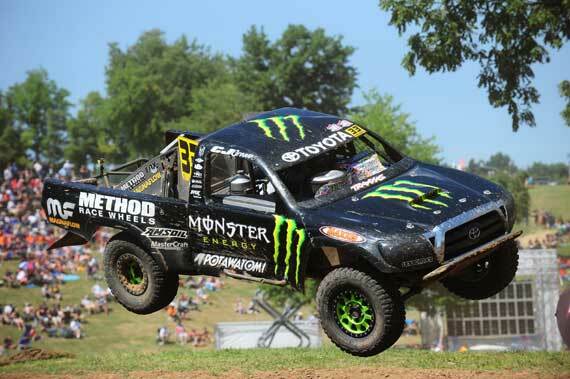 Abrams, WI (July 2, 2013)–Crandon International Off-road Raceway, known for its famous land-rush start and turn 1 mayhem, was ready to write another chapter in its rich off-road history book this past weekend as the TORC Series converged on the big track in a small town. Off-road fans from all over ignored the threat of rain and headed for their beloved track to watch Sportsman and Pro class trucks get it on. 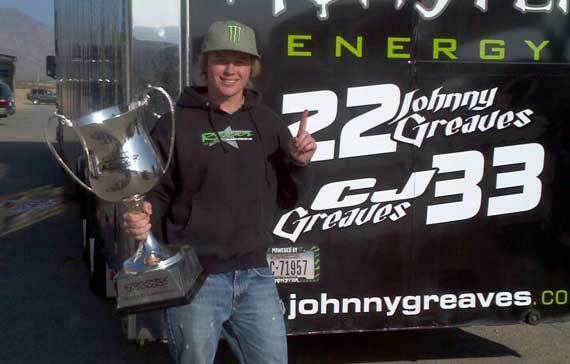 Greaves Motorsports was anxious to keep the momentum going from Bark River at a track where both Johnny and CJ have earned Championship rings. The weekend started wet on Friday as qualifying and practice had to be called-off. Saturday brought clear skies, Sunshine and some of the most exciting racing of the season. After a water pump issue in the Pro Light race, Greaves Motorsports proceeded to podium in all of the remaining races. CJ was running in 3rd when a mechanical problem sidelined him just ahead of the competition caution. Not to be discouraged, CJ mounted his Monster Energy / Toyota / Maxxis Tire / Method Race Wheel and (coming on-board for the Crandon Races) Forest County Potawatomi Pro 2WD truck and pulled a 2nd place finish. Johnny followed that up with a 3rd place finish, rolling his number 22 Pro 4 truck across the line with a right rear flat. Sunday was a “Monster” day for Johnny and CJ, who competed in epic proportion. CJ came back strong in Pro Light with a 3rd place followed by another 2nd place in Pro-2. Johnny put the icing on the cake with a 1st place Pro 4 and recapturing the top spot in the points standings. He also got his 3rd Oakley Bomb award of the year. To cap things off, Johnny and CJ ran strong in the first FCP Community Cup race–a race that pits Pro 4’s against Pro-2’s–made famous by the Chairman’s Cup and BorgWarner Cup race of days gone by. Johnny ended up winning the race and, for a while, it looked like Johnny and CJ might finish 1st and 2nd. But CJ was unable to make the final pass and ended up crossing the AMSOIL Finish line in an impressive 3rd place, putting both Greaves on the podium at the same time. Rewinding to recap the races: The Pro Light was up first on Saturday. CJ lined up 6th, almost directly in the middle of the line of 15 trucks. When the green flag flew, the wide line of trucks funneled down to hit the FC Potawatomi turn 1 holeshot. All the trucks made it through and CJ emerged in 3rd, but had to work hard to hold it. He was making up ground on the lead truck when he experienced mechanical problems and had to pull out of the race. CJ Greaves, unshaken by the misfortune, strapped into his number 33 Monster Energy Pro-2 Toyota, lining up 3rd, setting him up for the inside line of the holeshot. Ricky Johnson was driving the Bryce Menzies machine. Chad Hord won the holeshot with Steve Barlow in 2nd and CJ in 3rd. Rob MacCachren passed CJ for 3rd. The top 3 were hooked up and maintained some distance from the rest of the field. With only a few laps to go, Rob Mac did a 360 coming out of the gravel pit turn, sending him backward and CJ up to the 2nd position. It was Chad Hord’s day as he was able to take the win. But not without a fight–CJ tried several last lap challenges to get around Hord but couldn’t make it happen and settled for a hard fought 2nd place. Johnny was up next for the final race of the day. Johnny was stuck in traffic early in the race but patiently worked his way up into the top 4 at the competition caution. It was anybody’s race as the laps clicked off. The top 4, made up of Mark Jenkins, Rob Mac, Ricky Johnson, and Johnny, fought skirmishes with each other all the way to the end of the race. Rob Mac tried to stick a nose inside of Jenkins but couldn’t make it stick. Meanwhile RJ edged forward and power slid into Rob, door-to-door at the start finish line turn, taking the spot as the final lap, white flag flew. Johnny also showed Rob no mercy with some friendly contact to win the 3rd spot with the finish line in site. The contact almost backfired as Johnny had a right rear flat. The Maxxis tires held together long enough for Greaves to cross the line in 3rd. Sunday was another momentous day, or rather “Monsterous” day for Greaves Motorsports as the father-son duo continued to make racing history together. Johnny led off with another dominant victory, his 3rd of the year. When the dust settled as the field roared through turn 1, Johnny was in 4th but he didn’t stay there long. On about the 4th lap, he assumed the lead for good. RJ experienced some bad luck in the form of a rollover early in the race. This allowed Johnny to move back into first in the points standings by a narrow 7 points margin. For most it would be nerve-racking to sit on the starting line with Chad Hord on your right and Ricky Johnson on your left. Not so for the young CJ Greaves as he lined up for the Pro-2 race on Sunday. At the green flag, he charged ahead as the field tried to squeeze all 13 trucks into turn 1 as the crowd held its breath. CJ shot across the front stretch in 3rd behind Rob Mac and Chad Hord. The top 3 proceeded to pull away. It was game on as the intensity built following the competition caution. CJ worked his way up to the bumper of Hord and made the pass as the two exited the Oakley Time gravel pit turn. He began to pull away from Hord but was not able to catch up to MacCachren, who had established a sizeable lead. CJ took his comfortable 2nd place lead to the finish line for his 2nd podium of the weekend. Pro Light started with the familiar turn one pileup, which brought out the red flag. It took a long time for the track crews to untangle the 3 trucks involved. When they finished, a full restart was issued. CJ worked his way into the top 3 late in the race. With 2 laps to go, CJ pulled along side the second place running Brad Lovell in the Argon turn but could not complete the pass. On the final lap, he tried an early entrance into the gravel pit turn and biked it, losing some momentum and any chance to take the position. He was able to save it but crossed the line in 3rd. The final race of the weekend was the Forest County Potawatomi Community Cup Challenge race. Both Johnny and CJ were on the track at the same time. The Pro-2’s got a 12 second head start on the Pro-4’s. The formula is timed so that the Pro-4’s would catch the Pro-2’s with about a lap to go. However, Johnny caught the tail end of 2-wheel-drive trucks by the end of the first lap. CJ passed Chad Hord to take 2nd with Jeff Kincaid in the lead. With 7 laps to go, Johnny and CJ were nose to tail but Johnny was able to pass CJ and make the pass for the lead with 5 laps remaining. CJ was now running in 2nd of the Pro-2’s and 3rd overall. CJ edged up to the bumper of Kincaid and pulled along side on the front stretch of the final lap. Unable to pass, he regrouped for one more opportunity as the two took the final turn towards the start finish line. Johnny had already taken the win but the crowd was wondering if there would be a father-son finish. It was not to be, Kincaid held off CJ in a very exciting conclusion of the racing weekend and another amazing team effort for Greaves Motorsports. Of the 8 appearances, including the 2 trucks in the FCP Cup race, Greaves team podiumed in all but 1 race. The Greaves team will knock the dust off but will not be able to relax for long. The next stop is Chicagoland Speedway in Joliet, Illinois on July 19th and 20th. Abrams, WI (June 17, 2013)— Bark River International Raceway is a track that has been a favorite of Johnny Greaves for many years. Now, CJ Greaves has had the opportunity to fall in love with this fabled track too. The sprawling 1.6 mile track, one of the long tracks on TORC Series circuit, features some big jumps and wide sweeping turns as well as some tricky whoops and berms. The Monster Energy / Toyota / Maxxis Tire / Method Race Wheels / Magnaflow team of Johnny and CJ lit it up this past weekend in a 3 day thriller that ended with Johnny taking home a 1st place and 2nd place in Pro-4, while CJ made several trips to the podium pulling off a 1st and 2nd place in Pro-2 and 2 first place finishes in Pro Light. Johnny grabbed another Oakley Bomb award to add to his collection and CJ took his second Oakley and 2 more Maxx Lap awards for the fastest laps in Pro Light. All in all the Greaves Motorsports brought home a lot of hardware in their stellar weekend. The weekend was not all smiles with CJ having a tough time in the Friday night races. His comeback on Saturday and Sunday however was a testament of the team’s resilience and ability to bounce back. The Friday night races were a make-up for round 3 that was rained out in Eldora. CJ maintained his first place in the points standing in Pro Light. Johnny dropped down to 2nd in the Pro-4 but only by a few points to Ricky Johnson. CJ looked like a man on a mission in the opening night of racing in Bark River. He was flexing his Monster Energy Toyota Maxxis tire muscles and moved into 3rd at the end of lap 2. On lap 4, he passed Nick Baumgartner in the air off the big jump to take over second. He quickly set his sites on the front running Keegan Kincaid. On lap 5, he was attempting to make his move, he got out-of-shape in the whoops, made contact and spun out, sending him to the back of the field just ahead of the competition caution. He was able to make up some ground but ended up 9th. His luck would not improve for the Pro-2 race. He was looking very strong and had worked his way up to 3rd behind veteran Rob Mac and defending champion Bryce Menzies. On the restart, the mechanical bug struck and CJ had to pull out of the race. Johnny would come in and lift the teams spirit with a dominate Pro-4 race. Ricky Johnson was in the lead when Johnny made a great inside-out move to takeover the lead on lap 4. Johnny won the holeshot on the restart following the competition caution and never looked back. He had a nice lead until the final lap. RJ was able to apply pressure but Johnny held on for an impressive win. The team worked into the night, replacing motors and getting ready for Saturday’s racing. The Pro Lights hit the track first. With the motor replace and the Maxxis tires dialed-in to perfection, CJ grabbed the lead early from Rafael Navarro. CJ lead up to the competition caution picking up the 2 bonus points. He proceeded to win the holeshot and stretch his lead. 2nd, 3rd and 4th place racers battled hard behind him allowing him to maintain a comfortable lead and take the victory, collecting his 3rd Maxx lap award too. CJ put on a show in the Pro-2 race–showing some the off-road veterans he could dice it up with the best of them. He started on row 3 beside Rob MacCachren. On lap 1, Rob Mac took a spin into the water filled ditch in Cemetery turn bringing out a rare full-course caution and a complete restart. CJ worked his number 33 Toyota around Mike Jenkins to move into second. Jeff Kincaid was in the lead but as the competition caution came out, he pulled out of the race with mechanical issues, handing the lead over to CJ but with a lot of pressure being applied by Bryce Menzies all the while Rob Mac was edging back up to the front. With just 3 laps to go, Bryce stuck his fender to the inside of CJ. As CJ tried to defend his position, Rob Mac took advantage and passed both of them for the lead. CJ held on to finish 2nd in an incredible race. Johnny’s Pro-4 race would not go as planned. He was in 4th place when he lost front wheel drive early in the race, taking him out of contention. Johnny would make up for it on Sunday with a 2nd place finish behind Mark Jenkins who got his first Pro-4 win. Sunday the team was confident they had everything working at peek performance level. This would prove to be the case as both Johnny and CJ took top podium spots. CJ worked his magic first in the Pro Light. He had his Monster Energy / Toyota / Maxxis Tire / Method Race Wheels / Magnaflow number 33 up to 3rd place before the end of lap 1. On lap 5, he passed Nick Baumgartner to take over the lead. At that point he proceeded to check-out, dominating the rest of the race to earn back-to-back Pro-Light wins. 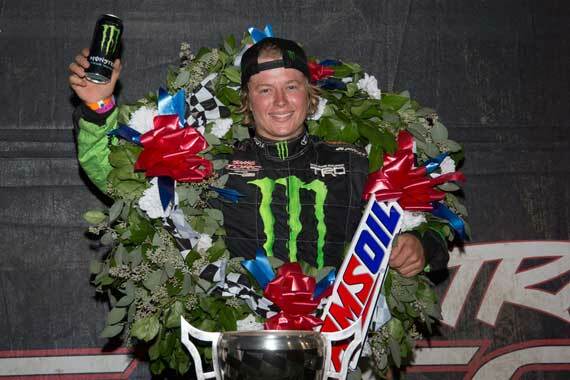 Who would bet that CJ would hop out of his Pro Light, hand over his trophy and Maxx lap award to his dad, climb into his Pro-2 and expect him to win that race too? Well if you did, you lost–CJ was able to pull off a first place win in the Pro-2 and earn a Oakley Bomb award too! The crowd was anticipating another epic battle between Johnny Greaves and Ricky Johnson for the final pro truck race of the weekend. With the inverted field, the two would have to fight their way around a number of racers who were equally as hungry for wins. While Johnny, Ricky and Scott Douglas battled for position, Mark Jenkins was able to pull away from the field. RJ had a flat and had to change it at the midway point but was able to pass Scott Douglas eventually for 3rd. Johnny ended up in 2nd behind Mark Jenkins. 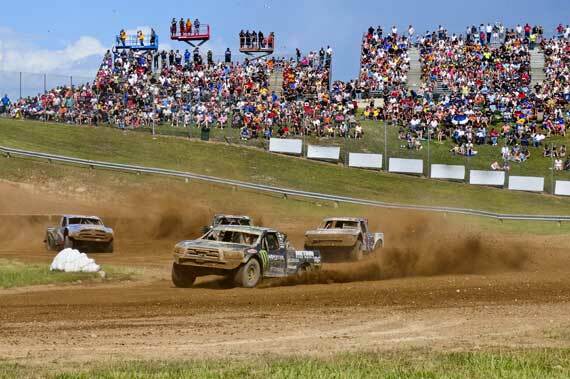 Up next for the Greaves Motorsport team is none other than the Mecca of off-road racing: Crandon International Off-road Raceway on June 29th and 30th. Abrams, WI (May 13, 2013)– The Traxxas TORC Series added another track to its long list of venues by heading to the Big E: Eldora Speedway in New Weston, Ohio, owned by NASCAR great, Tony Stewart. The skies were blue when the Monster Energy / Toyota / Maxxis Tire / Method Race Wheels Magnaflow team of Johnny and CJ Greaves rolled into town. However Mother Nature pulled a cruel Mother’s Day weekend trick on the series by blowing in cold rainy weather to put a damper on the weekend’s racing. Friday’s race had to be cancelled including practice and qualifying. Saturday did not look very promising either but the series waited out the storms and decided to run the races. The Pro Light took the brunt of the poor conditions by competing on a mud soaked track. CJ showed a lot of poise by nursing his Monster Energy Toyota to a 4th place finish. He was able to hold on to his points lead. Track conditions began to improve by the time the Pro 2’s and Pro 4’s hit the track. CJ dominated the Pro 2 by leading from start to finish for his first win of the season and his first Oakley Bomb award. Johnny lead most of the laps but a late race bobble allowed Ricky Johnson to pass. Johnny claimed the 2nd place finish but held on to his points lead. Breaking down the Pro Light race, CJ started from row 3 on the very muddy track. The trucks were barely recognizable with the amount of mud caked on them, adding another 2 or 3 hundred pounds to the vehicle. One truck after another had to drop out of the race due to crashes or mechanical failure. CJ was in third place before the end of lap 1. He made his way up to 2nd after a full course caution. Keegan Kincaid slid from 4th all the way to first while at the same time, CJ lost a little ground back to 4th. CJ wisely tried to stay smooth and out of trouble. He stayed in the fourth place spot through multiple cautions and that is where he ended the race. He was able to maintain his lead in the standings. CJ turned in one of his best performances in the Pro 2WD class. Starting from the poll position he won the hole shot and never relinquished the lead. The Eldora track did not have the familiar infield turns and tabletops. Instead the oval featured a number of jumps that challenged the drivers to not land wrong on their front wheels and risk a flat. CJ was perfect, hitting every turn and jump with precision. With clean air, he pulled the fastest lap times, earning him his first Oakley Bomb award. Johnny was up next in the Pro 4×4. He had his Monster Energy Toyota dialed in and Maxxis Tires / Method Race Wheels hooked up. Scott Douglas took the early lead, but landed sideways on his tires in turn one that would later result in a right rear flat. Johnny also managed to tag the wall on the front stretch, and was able to continue with no apparent damage. A full course caution came out when Mark Jenkins crashed. Douglas tucked into the hot pits to change his tire, giving Johnny the lead. With a few laps to go, Ricky Johnson began to apply the pressure on the black number 22 of Johnny Greaves. The two made contact several times. RJ was able to pass but Johnny battled back. These battles between RJ and JG are becoming a familiar sight for TORC series fans. With 3 laps to go, Johnny landed squirrelly that broke his momentum. This gave Ricky the opportunity to pass Johnny. Johnny tried several times to get around RJ but ran out of time and settled for a hard fought 2nd. He was able to hold on to his narrow points lead. Next up on the TORC schedule is the more familiar, sprawling Bark River International Raceway, a track where Johnny has enjoyed a lot of success. Rounds 6 and 7 will take place on June 15-16th in the Upper Peninsula of Michigan. Abrams, WI (April 15, 2013)–Johnny Greaves and son CJ were pumped and ready to hit the dirt as The Off Road Championship (TORC) 2013 season got underway in Dodge City, Kansas, this past weekend. All the pre-season testing and training paid off as both Johnny and CJ made appearances atop the podium in their respective classes. CJ was the first to strike gold in the Pro Light class on Friday night with a second place finish. He followed that up with a win on Saturday as well as a third place finish in Pro 2WD on Saturday. He also took the Max Lap award for the fastest lap in both Pro Light races. Johnny suffered mechanical problems in Friday’s race but the team did not panic because they new they had a fast truck. Johnny proved it Saturday with a dominating first win of the year. He also took the Oakley Bomb award. In the Friday race, Johnny stayed on the track to salvage valuable points and finished fourth, several trucks dropped out of the race. The Pro Lights were first to rip into the dirt at the new venue for TORC: Dodge City Raceway Park. The converted oval provided a lot of excitement for the near capacity crowd under the lights on Friday evening. CJ Greaves rolled off his new Monster Energy Toyota Maxxis Tire Pro Light on the third row. When the dust settled from the rolling green flag start, CJ was in fourth place. CJ had some tough battles with Shawn Morris but managed to take over the third place spot just ahead of the competition caution. As Brad Lovell and Doug Mittag traded licks up front, CJ, while at the same time holding off Morris, was able to take second when Keegan Kincaid went wide as they took the tight turn coming into the infield rhythm section. On the white flag lap, Lovell swung wide entering the infield, which turned out to be a problem spot for many drivers. CJ muscled his number 33 Toyota through and took second. However, it wasn’t easy, he had to stay strong as the two banged fenders fighting for position. CJ was able to hold him off and take the second spot on the podium. 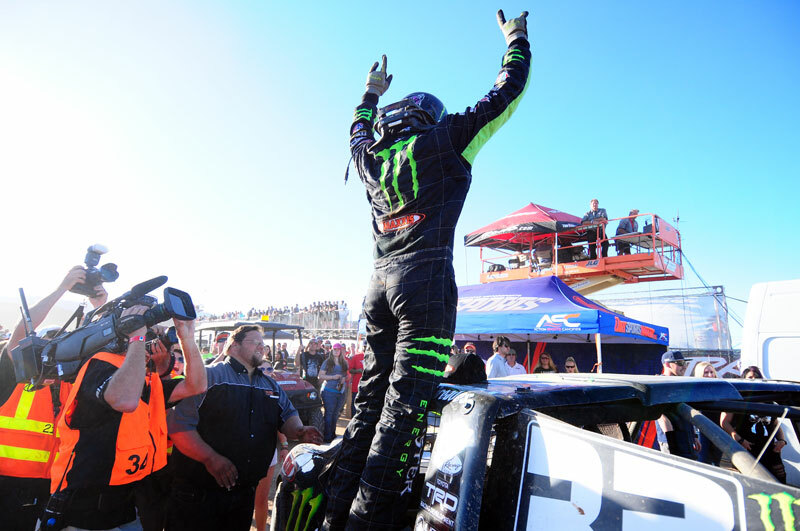 CJ Greaves jumped off the podium and headed back to the pit to climb into his Monster Energy Toyota Pro 2WD truck. He started near the rear but was not intimidated by the strong field in front of him. He was making progress, working his way through the field and made it all the way up to fifth when he hit a hole wrong and broke something in the front-end. Still confident, he was anxious to get ready for Saturday’s race. Johnny had a similar fate in his first appearance of the 2013 season. He started in a familiar spot, next to the defending Pro 4 champion: Ricky Johnson. Johnny shot out of the gate as the green flag flew. He was running in third as they completed the first lap. On the second lap, he experienced mechanical problems and he slowed to pull off the track. He managed to get the truck going and stayed out of the track to salvage points. With other trucks having problems, Johnny finished the race in the 4th spot. The crew worked feverishly to get all three trucks ready for Saturday’s races. As the evening fell, crew chief, Brad Marty, was confident, everything was ready. CJ puts some action behind the confidence as he took the lead in his Pro Light halfway through the first lap and checked out. He held the lead through multiple full-course cautions and took it all the way to the checkered flag for his first win of the season. In the Pro 2WD, the younger Greaves started in the back of the field once again. As Chad Hord and Mike Jenkins exchanged blows up-front, CJ patiently worked his way up front and was in fifth at the competition caution. In the second half of the race, CJ took it up a notch and went right after the third place running Chad Hord. He battled hard with the veteran and made an inside move to grab the spot. He then set his sites on Bryce Menzies to make a late race charge to move up another position. CJ tried several lines, each time making a charge then regrouping to try something else. He stayed clean and pulled off the third place finish, climaxing a very exciting opening day for the young racer. It was all Johnny in the Pro-4 race. Johnny started on row 2 and shot right to the lead when the green flag flew. A lot of trucks had trouble in the race. RJ pulled out with a steering problem. Scott Douglas and Andrian Cenni had several crashes. Douglas rolled but landed on all fours and ended up finishing in second. No truck had anything for Johnny. He was strong from start to finish and won with a comfortable margin to add yet another win to his resume. Johnny left the weekend leading in the Pro 4 and CJ in the Pro Light: a great way to start the season. Next up for Greaves Motorsports will be another new venue for TORC, Eldora Speedway in New Weston, OH. 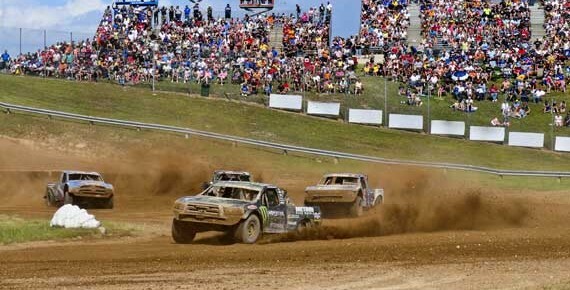 TORC will introduce short-course off-road racing to the Eldora, a mainstay on USAC’s Sprint Car circuit. The weekend races are scheduled for May 10-11th. Temecula, CA (March 26, 2013)— Johnny Greaves Motorsports packed up the haulers early in March and headed west for some testing in preparation for the upcoming TORC Series season. Johnny and CJ are excited about the testing thus far and, with the strong backing of Monster Energy, Toyota, TRD and Maxxis Tires, they feel very confident about their competitive edge when the season kicks-off next month. Johnny will be sporting a brand new Pro-4 and CJ will be in a new-and-improved Pro-2 which debuted last year. The Pro Light is also a new truck. The team will start testing the Pro Light later this week. Greaves Motorsports welcomes Method Race Wheels in an expanded role and new comer MagnaFlow performance exhaust systems. Johnny and CJ put their improvements and practice to the test this past weekend as TORC/USAC held its inaugural TRAXXAS Combine in Primm, Nevada. This five day event offered Pro Off-Road teams the opportunity for open testing at one of the most famous off-road tracks in the west. The testing would also feature a special money race and the opportunity to have their named engraved on the “Combine Cup” for logging the fastest times in each class. All the veterans and some new aspiring racers were there to knock the cobwebs out, get the feel for their machines and see how their off-season work stacked up against the competition. TRD had technicians on hand to tune the Toyota all weekend and the motors ran great for Johnny and CJ. In fact, CJ went head-to-head with last year’s Pro-2 champion Bryce Menzies and the other veterans and laid down the fastest times earning him the right to be the first Pro-2 driver to have his name on the Combine Cup. Johnny ran good in the Pro-4 but by day two he began to experience some trouble in the front differential that slowed the tuning process. But overall, Johnny was very happy with the performance and will continue testing for the next three weeks. The Off Road Championship (TORC) Season kicks-off on April 12th at Dodge City Raceway in Dodge City, KS. TORC will have unprecedented TV coverage this year with 6 LIVE television broadcast on SPEED TV and a season finale in Antelope Valley, CA, LIVE on NBC! Be sure to follow all the action of Johnny and CJ on JohnnyGreaves.com and on Facebook and Twitter. Throughout a drivers career they all have one of those seasons that nothing seems to go right. Coming down to the last lap and a part malfunctions costing them the victory, or the growing pains of a new team that hasn’t quite clicked yet, or just a weekend at the race track of pure bad luck. 2012 was one of those seasons for Johnny Greaves and his team. But a true fighter never quits no matter what the circumstances or obstacles that present themselves, Johnny is no exception to this, he is a true fighter by all accounts till the last checkered flag drops and always a force to contend with at the race track. A tremendous amount of effort and time has been put into researching new and better parts for this truck, evaluating those that failed and just improving upon the truck as a whole are the goals of this new ride. “Pro 4 fabrication is an open book where we can pretty much do whatever we want, we are very excited about heading into the 2013 season with this new truck,” said Johnny. In addition to fabricating the new Pro 4, the crew is also building a new Pro Light for CJ Greaves to pilot in the 2013 season. While CJ had a good year in the Pro Light truck, it was and older style chassis that was built from 1-1/2 tubing. The new truck will be constructed from 1-3/4 tubing making it much safer for CJ and meeting the new TORC safety requirements. “Last season we had another guy prepping the Pro Light for us prior to each race, which resulted in somewhat of a disconnection to the truck for CJ. This year we will be maintaining and prepping all three trucks ourselves which will help CJ get that connection back with the truck,” explained Johnny. Two brand new trucks and some minor improvements to the third truck will place Johnny, CJ and their crew in a prime spot to be a major team to contend with in the new season. “Last year was the first year for much of our crew which was difficult at times because we just were not clicking yet. Our crew this year, will be the same as last year with a Crew Chief for each truck, everyone understands their responsibilities now and everything has fallen into place, we are going for a championship in all three divisions will all guns firing,” explained Johnny. 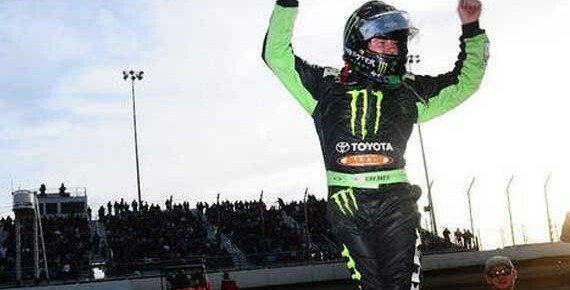 Early in 2013 the Toyota Monster Energy trucks and their drivers will be headed to California for some early testing to prepare for the new season. “We want to get in as much testing as we can with these new trucks and be as far ahead of the game as possible,” said Johnny. The black and green team will be poised and ready for a competitive and exciting season. With years of competition experience, a solid passion for the sport, and some brand new hardware, the Greaves fans will be sure to have something to look forward to watching the No. 22 and No. 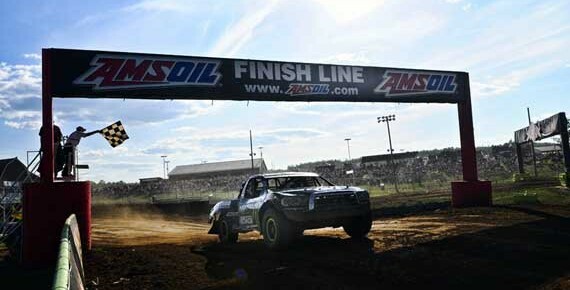 33 trucks battle it out in the 2013 Traxxas TORC Series Presented by AMSOIL. For more information on Johnny, CJ and their crew check out their website at www. http://johnnygreaves.com. Johnny and CJ are sponsored by Toyota, Monster Energy, Method Wheels, Maxxis Tires, Victory Signs, Fox Shox, Master Craft.